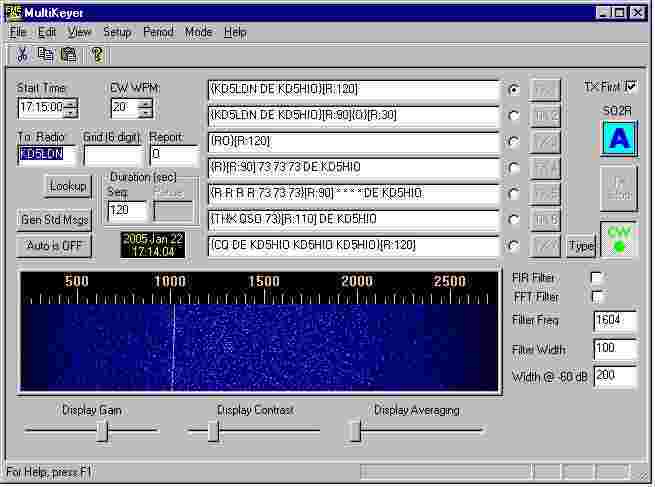 Uses serial COM ports to send CW and PTT signal, Soundcard to send .wav files. Multikeyer can be configured for PTT interrupt to either the serial or parallel port. Optionally interfaces with the TRX-Manager program for PTT and CW keying. MultiKeyer will also send a callsign to TRX-Manager for logging. CW message syntax is similar to that used in TRX-Manager. MultiKeyer is designed to run under Windows 98 and NT, and requires a 133 MHz Pentium-class or better machine. Users have reported that MultiKeyer generally works fine on Windows 95, ME, XP, 2000, and perhaps others. I will not promise this, as I cannot test it across all systems of interest. If you run Win 95, you will likely have to install Microsoft patches (Year 2000 fix and the OLE patch, as a minimum), to get it to work. Please visit the AXCEL216 web page for more info on Win 95 and OLE patches. The program consists of a single executable file "MultiKeyer.exe." This file can be placed anywhere, but it is probably best to create a new folder (directory) for it ( C:\MultiKeyer\ for example). Simply unzip the MultiKeyer.zip file in your chosen directory to perform the installation. Note: The parallel port interface on version 1.0 will only function properly on "unprotected" Windows versions, such as Win 95 and Win 98. Multiuser systems such as Win NT, Win 2000, and Win XP "protect" the parallel port such that MultiKeyer cannot access it (you will get a protection fault if you try). Please consult the web for more information and possible workarounds (please see PortTalk). Download MultiKeyer 1.1 (zip file archive). Use this version for Win 95/98/ME. Download MultiKeyer 1.1 (zip file archive). Use this version for Win 95/98/2000/NT/XP. This requires that you download Logix4u's Inpout32.dll parallel port access library. Please place the inpout32.dll file in the MultiKeyer execution folder to install the library. v1.1 (01/22/05) Added FFT display, narrow filtering options. Fixed keying delay bug, and other issues.